Although acute malnutrition is a continuum condition, severe and moderate acute malnutrition are managed separately, with different treatment protocols sometimes operating out of different physical locations, using different therapeutic products and supply chains. These problems often lead to treatment being offered only for the most severe form of malnutrition, despite the fact that children with moderate acute malnutrition (MAM) are three times more likely to die than well-nourished children and that MAM affects 11% of children globally. A more cost-effective and simple approach is therefore needed, so that more children can be reached before they deteriorate to such a critical condition of undernutrition. 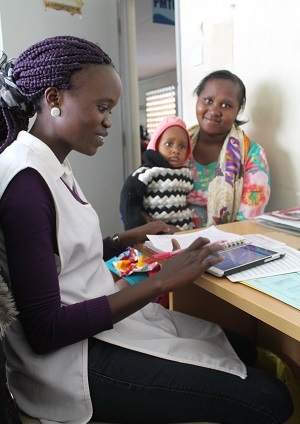 The Combined Protocol for Acute Malnutrition Study (ComPAS) aims to examine whether a simplified and unified MAM and SAM treatment for children 6–59 months would improve coverage, quality, continuity of care and cost-effectiveness in resource constrained settings. The study is being run in two locations: an urban setting in Nairobi and rural South Sudan. The study is testing these simplified protocols, with a reduced dosage of RUTF, through a cluster randomised control trial and comparing it to a standard protocol (control group). The study includes a total of 24 clusters, with 12 in each country. The primary outcomes to be analysed include recovery rates, coverage, length of stay, average daily weight gain, weekly MUAC gain and cost-effectiveness, which will be assessed through an economic analysis of financial data following the study. A follow-up study at 4-months after discharge is also being conducted. Information can be found here. The results of this study could be used to influence practice and policy, particularly in high burden settings where health systems are often overburdened and unable to support the current dual service delivery model. A simplified treatment approach could lead to more children whose lives are at risk receiving the vital treatment that they need. The final effectiveness and cost-effectiveness results will provide key information for policymakers when considering alterations to the global acute malnutrition treatment protocols. As a non-inferiority trial, the recovery rates are expected to be statistically similar between each protocol, hence the comparative cost-effectiveness will likely play a larger role in policy decision-making. PARTNERS: Research consortium led by the Action Against Hunger and the International Rescue Committee (IRC). ComPAS is supported by an expert task force of scientists at the London School of Hygiene and Tropical Medicine, Washington University School of Medicine, and University of Tampere. Combined Protocol for Acute Malnutrition Study (ComPAS) in rural South Sudan and urban Kenya: Study Protocol for a randomized controlled trial. The "ComPAS Trial" Combined Treatment Model for Acute Malnutrition: Study Protocol for the Economic Evaluation. The economic evaluation protocols are a critical part of our research to test if a new combined approach for treatment of moderate AND severe acute malnutrition is cost-effective.